Gretna Wedding Cake- Small Single-tier Square Cake with Silk Topper and Tartan ribbons. Ref jc-G18-S1A Small Square Single Tier Wedding Cake with Tartan Ribbons- based on traditional Scottish elements including thistles and tartan ribbons. Provides around 35-40 portions. 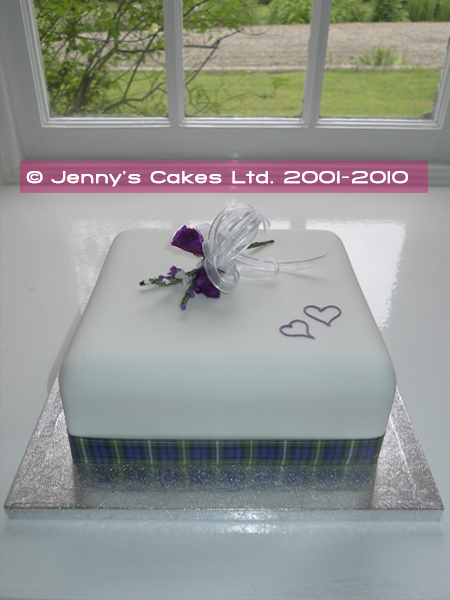 This square Scottish Wedding cake has been designed for smaller weddings at Gretna– a simple square wedding cake, decorated with a spray of silk thistles, heather and blossoms and two piped hearts and soft ribbon loops Displayed with a Pride of Bannockburn Tartan Ribbon around the cake (other ribbon options available). A narrow plain ribbon around the base board of the cake completes the design. Priced from just £140 including personal delivery to your Gretna Wedding venue.